Each city has a street that represents it and reflects its unique atmosphere and cultural background, like Piccadilly or Broadway, a street where everybody goes sooner or later, where the life is. The main street. In Odessa it is called Deribasovskaya. However, it is not easy to realize that it is the main street. For the first glance it is just a street. A pedestrian one, that’s all. But this is Odessa! Odessa is a big village. It is not New York or Moscow, it is a city where everybody knows everybody. If you want to see old friends without calling them, stroll along Deribasovskaya Street. If there is someone you don’t want to see never go there. 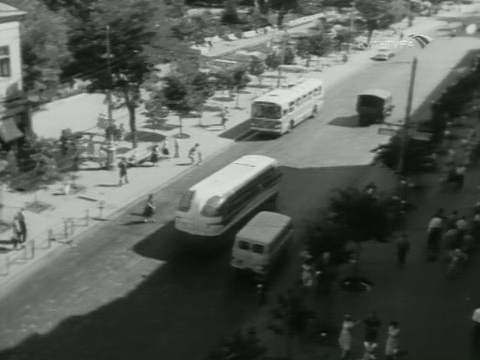 Despite having a million inhabitants, Odessa has just one street where everybody meets. Even though you do not see crowds in that street, except for public holidays. Sometimes you wonder where everyone is gone and if Odessa really has that million. The street is divided into two equal parts. The first part has nothing special, except for the monument to de Ribas and is open for traffic. The second part is pedestrian but it lacks the benches in the middle, like in many main pedestrian streets elsewhere in Ukraine and Russia such as Arbat in Moscow. This is where restaurants and boutiques are. The pavement is cobblestones that have not been replaced for a long time, probably since they were laid. 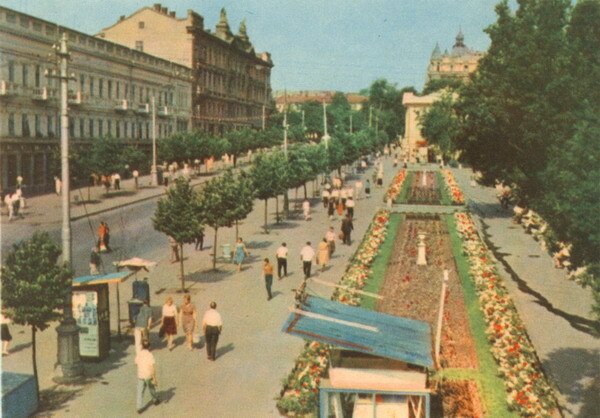 The street became pedestrian in 1984. The total length of the entire street is 1 km. It is considered that the street was named after the founder of Odessa. This may be true, yet it is more likely that it got this name after his brother Felix who lived in this street and later donated his garden to the town. Taking into account that there was a tradition in Odessa to name streets after a famous person who had lived in that street (Lanjeronovskaya, Pushkinskaya, Marazliyevskaya), it seems that it was the case with Deribasovskaya as well. Later Felix was forgotten and people got to believe that the main street had been named after Joseph, the founder. But it is notable that Joseph soon left Odessa for St.Petersburg, while Felix stayed here, and up to now his descendants live in Odessa. One of them wrote a great book on the history of Odessa in the 19th century. Early 1960s. A shot from a movie. Since 1811 the street has born the name of Jose de Ribas y Boyons. The brave commander was wounded twice fighting in Izmail and lost his right hand. He is the founder of Odessa and for three years was the governor. 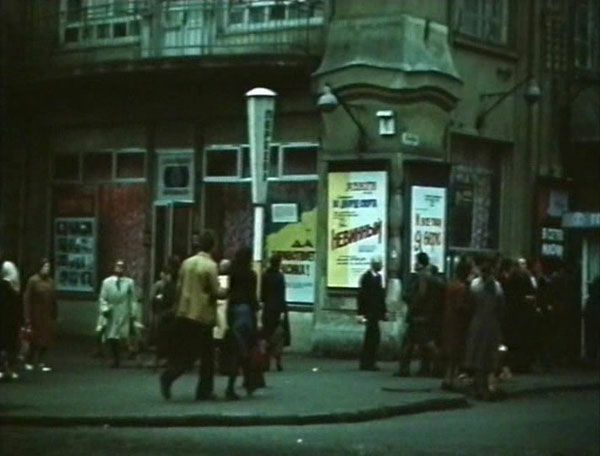 The street was renamed several times after the revolution but the Odessites would stubbornly call it Deribasovskaya, and in Soviet Odessa it was one of the few streets that retained their historic names. There are several architecture masterpieces in the street: the Passage Hotel, the Bolshaya Moskovskaya Hotel and the building of Richelieu Lyceum. The first public park, is also here. It was a gift to the city from the city founder’s brother Felix de Ribas. The monument to Jose de Ribas was formally opened at the beginning of the street for the 200th anniversary of Odessa on the 2nd of September, 1994. There are other monuments in this street, for the example to the 12th chair, to singer Utyosov and others.